As children, we develop stories about how the world works, most of which get improved upon and amended over time. But some do not, even as we mature in other ways. Opinionated, self-centered and fear-driven, these "child stories" are the source of the behavioral and emotional patterns that hold us back. When we learn to identify and rewrite these stories, we can do remarkable, even magical things. "Filled with fascinating stories illuminating the many challenges to our inner and global well-being. . .Pathways to Possibility is a treasure trove of human journeys that reveals the deep nature of who we are and how we can create a more meaningful life." "You must read Pathways to Possibility for it is an extraordinary, a unique, book." "Rosamund Zander is the best companion to walk you through your next passage. Her words radiate possibility as she leads readers out of the darkness of an old story, showing us how to change it, open up, and move into the lightness of love and gratitude." "In this eloquent and elegant book, Rosamund Stone Zander offers us a visionary and practical guide to living fuller, more compassionate lives for ourselves and others." 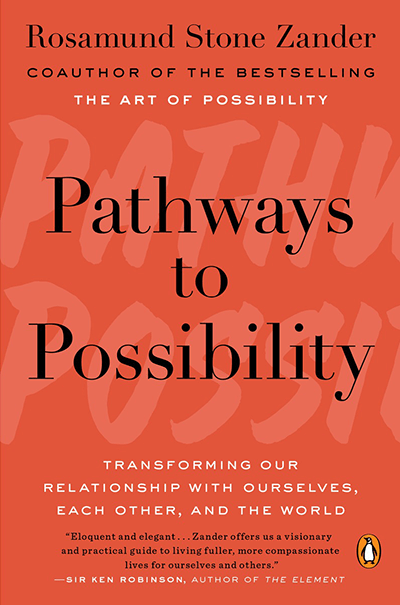 "Pathways to Possibility is a great stepping stone from Rosamund Zander's previous book, The Art of Possibility. . .She's teaching us all how to be architects of the spirit."